A protestor facing Venezuela’s national guard in May 2017. Photo: Efecto Eco. Courtesy Diálogo Chino. All rights reserved. The Chinese government has said little about the dire situation in Venezuela, while few other outside actors – including nearby Latin American neighbours – have called attention to China’s role in it. This oversight is both puzzling and misguided, given China’s high-profile economic and diplomatic partnership with Venezuela. The lapse is rooted in China’s foreign policy principle of noninterference in other countries’ domestic politics, its own undemocratic political system, and its claims of fostering win-win relationships with other developing countries. All of these factors have combined to create a deafening silence regarding Beijing’s role in addressing what is, in the end, a crisis of democratic governance in Caracas. It is long past time to ask whether there is more that Beijing can and should do to help set Venezuela on a more sustainable path, both out of principle and China’s own practical national interest. Ultimately, China’s involvement in and response to Venezuela’s multilayered turmoil underscore a range of broader economic and diplomatic challenges that Beijing faces in its relations with other resource-rich, crisis-wracked developing countries around the world. Over the past decade, China has become Venezuela’s key overseas financial lifeline. Venezuela’s current crisis is grounded in the polarisation of domestic politics and society overseen by former president Hugo Chavez and his politicisation of the state oil company, Petróleos de Venezuela S.A. (PDVSA). Since 2013, when Chavez died from cancer and Nicolas Maduro won a narrow victory to replace him, Venezuela has experienced a further rise in political and social conflict and a more dramatic deterioration of effective governance. The precipitous fall in global oil prices, beginning in 2014, pushed Venezuela’s oil-dependent economy into full-blown crisis. 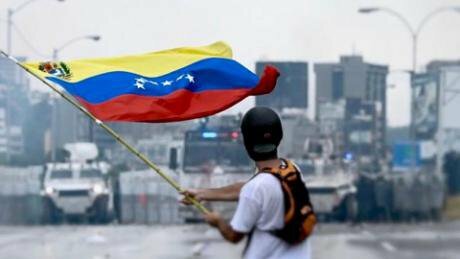 The 2017 version of Venezuela is known for shortages of everything from toilet paper to medicine to foreign exchange reserves, and the country is increasingly associated with scenes of street protests and violence. Today, Venezuela is far removed from the heady days, only a decade ago, of Chavez’s Bolivarian Revolution agenda, underwritten by US$120 per barrel oil prices, and instead the country is seen as an economic basket case and a political pariah. The heyday of Chavez’s political dominance during the first decade of the 2000s coincided with Beijing’s dramatic upscaling of its commercial and diplomatic relationship with Caracas. Yet as Venezuela has descended into its post-Chavez crisis, most discussions about how outside actors can help promote change have focused not on China but on Venezuela’s neighbours in the Western Hemisphere and multilateral regional bodies, especially the Organisation of American States (OAS). The clearest, most forceful voice has been that of the Secretary General of the OAS, Luis Almagro, who did not mince words when he recently declared that “Legitimate democratic authority [in Venezuela] has been lost, and the government has decided to opt for authoritarianism and repression to maintain…power.” Given how little traction regional and other multilateral efforts to engage with Venezuela have gained, and in light of China’s massive loans-for-oil ties to Venezuela, Beijing’s role must be more carefully understood and scrutinised. Over the past decade, China has become Venezuela’s key overseas financial lifeline, providing the oil-dependent economy with over $60 billion in oil-backed loans and tens of billions more in other contracts and investment deals. Venezuela is the largest recipient of Chinese state-backed loans not just in Latin America but of any country in the world. Perhaps unsurprisingly, then, media coverage and financial market analysis of China’s role in Venezuela have focused almost exclusively on the dual issues of whether Chinese state-owned banks will continue to provide Caracas with a credit lifeline and whether Venezuela will be able to pay back what it owes through long-term oil shipments to China. This narrow emphasis on the loans-for-oil relationship underscores the absence of a broader discussion about China’s role and responsibility in Venezuela’s current predicament, including Beijing’s potential inclusion in regional and multilateral efforts to address the crisis. This is a pressing concern because it has become apparent in the past few years that the long-term sustainability of China’s loan arrangements with Venezuela is highly suspect. In the crucial aftermath of the 2008 international financial crisis, Venezuela was largely cut off from global financial markets and development finance, and Chinese state-backed loans allowed Chavez to continue to pursue otherwise unsustainable economic policies. Consequently, Chinese lending has saddled Venezuela with unsustainable debt and oil export burdens. Even when oil prices were high, there were concerns that Venezuela had entered commercially ill-advised deals with China in the name of Chavez’s ideological and foreign policy goals. Yet after Chavez’s death and following the drop in oil prices, the conversation has shifted noticeably to Venezuela’s inability to either service the debt principle or maintain its oil shipment commitments to China. Ultimately, Venezuela is faced with the choice of defaulting on its loan and oil shipment agreements or further curtailing government spending on domestic social and humanitarian programs in order to service its debts to China and other creditors. Chinese lending has saddled Venezuela with un- sustainable debt. China’s patience with its erstwhile Chavista chums has begun to wear thin. Much about this bilateral loans-for-oil relationship remains murky, but what is clear is that Chinese lending, principally through the China Development Bank, has slowed substantially over the last two years or more. After meetings between Chinese and Venezuelan officials in Caracas in 2016, one Chinese official stated, “The consensus was that no new money was going to be invested…There was a clear message from up top: Let them fall.” Such expressions of impatience and exasperation stand in stark contrast to Beijing’s long-term “patient capital” approach and the effective risk assessment that was supposedly behind China’s earlier decisions to offer such massive loan commitments to Venezuela, despite obvious signs of economic and political risk. In fact, Beijing’s frustrations with Caracas have long brewed beneath the surface. Close political ties and massive Chinese lending—even going back to the Chavez years—have failed to translate into either the privileged oil investment opportunities in Venezuela’s Orinoco Basin or the high volume of oil flows that China had expected. Given that Beijing has built up such close—if in many ways troubled—financial, trade, and diplomatic relations with Caracas, now is the time to include China in broader discussions about addressing Venezuela’s plight. Moving forward, these discussions should begin by seeking to explain China’s relative absence from such conversations about the role of outside actors in helping to resolve Venezuela’s deepening crises to date. Take, for example, the presumed alignment between China’s practical short-term commercial and diplomatic interests on the ground, and Beijing’s long-standing commitment to noninterference in other countries’ domestic politics along with its proclamations of diplomatic solidarity with other developing countries. China may view the chaotic status quo in Venezuela as a safer bet for having its loans repaid and ensuring future oil shipments—not to mention preserving its close state-to-state ties—than a transition to a different, possibly opposition-led government. If that is the case, such calculations would seemingly dovetail with Beijing’s commitment to diplomatic noninterference and South-South solidarity. Likewise, Venezuela’s neighbours and multilateral organisations like the OAS may view China’s noninvolvement in discussions about Venezuela’s future as flowing naturally from Beijing’s practical self-interest in the status quo and China’s aforementioned foreign policy principles. If so, this may prompt these other parties to refrain from even asking about a possible Chinese role in outside efforts to advocate for change in Venezuela. Beijing has myriad hard-headed reasons to seek a more sustainable path for Venezuelan economic governance. In terms of material self-interest—given China’s huge loan and investment exposure in Venezuela, not to mention Venezuela’s oil and its importance for Chinese energy security—Beijing has myriad hard-headed reasons to seek a more sustainable path for, at the very least, Venezuelan economic governance, especially in the oil sector. Venezuela appears to already be in a form of de facto default on some portion of its Chinese loans, at best able to pay back only interest. If this is the case and if Venezuela is not sending the volume of oil China has counted on, then the logic behind Chinese support for maintaining the status quo may be far weaker than most would assume. Of course, neither Venezuelan nor Chinese officials have made what would be a politically explosive acknowledgment of default nor have they admitted that the status quo is serving neither side well. Instead, for several years, Chinese officials have calculated that their narrow economic and diplomatic interests would be best protected by a continuation of the status quo. But given the aforementioned trends, it seems highly uncertain that this model will remain sustainable over the medium or long term. This loans-for-oil model has long since become untenable, and this may perhaps pave the way for a discussion about how Beijing’s engagement with Caracas might change. The inherent contradictions in China’s material self-interest and the principles-based logic of its developing-country diplomacy have been growing in recent years. China’s own official foreign policy doctrine of peaceful development – with its emphasis on so-called win-win, complementary relations—has long claimed that economic development and stability go hand in hand when it comes to China’s engagement with commodity-rich developing countries like Venezuela. But this narrative no longer suffices, even in terms of China’s ability to navigate its own increasingly complex global role by simply expressing vague hopes for stability in countries experiencing economic crises and democratic and governance breakdowns. China’s conceptual and policy frameworks have come up short in the case of Venezuela. Economic governance and social stability cannot be separated from other aspects of governance or from politics itself. Venezuela’s fundamental problem is a breakdown of democratic governance. After all, the OAS’s criticism rests clearly and directly on claims that Caracas is violating regional standards of democracy. And Maduro’s recent calls for an assembly to rewrite the constitution have elicited sharp criticism from neighbours such as Argentina, Brazil, and Chile that such a move would amount to a coup and a definitive move toward authoritarianism. For its own part, China may already be moving away from a rigid adherence to its policy of noninterference and increasingly finding that its own practical national interests might necessitate new forms of involvement or engagement on contentious issues of domestic governance in other countries, including Venezuela. Yet even if China’s approach is shifting in this way, what such involvement might look like in practice and how it would be received by the international community, let alone its own citizens, are crucial questions that are certain to be controversial. Venezuela is currently the most prominent case of a country that has an unsustainable debt relationship with China. For China, how to understand what constitutes good governance in overseas contexts, especially concerning the domestic politics of developing countries, is a very thorny issue. How realistic, or desirable, would it be to expect China to weigh in on the form and character of Venezuela’s democratic governance? After all, China is not a democracy. The fact is that defenders of Beijing’s so-called models of development and governance argue that China has crafted an effective alternative to Western liberalism. What possible legitimacy would China have in discussions about democratic breakdown, and alternatives to it, in a place like Venezuela? Such questions and contradictions highlight the potential limitations of China’s involvement and its broader contributions to global leadership and governance. However, this should not rule out a more open conversation about what more Beijing can and should do now. A starting point could be to focus on governance issues that are of importance to Venezuela, China, and the rest of the international community – including debt sustainability, the oil sector, and environmental sustainability. Venezuela is currently the most prominent case of a country that has an unsustainable debt relationship with China, which in the end has involved high costs for both parties. More broadly, Chinese-led development initiatives in its own region are already prompting concerns about potential “debt servitude.” Therefore, China can and should work with Venezuela’s neighbours and international institutions to think about how to help alleviate the current crisis, but also to set a precedent for China’s lending in other parts of the world. In terms of oil-sector governance, it may be worth exploring a possible multilateral effort to help find ways to ensure that the extraction and use of Venezuela’s extra-heavy crude oil aligns with Chinese and global efforts to fight the effects of climate change. China should also consider working through multilateral regional organisations with which it already has solid working relationships, such as the Inter-American Development Bank, the Venezuela-based development bank Banco de Desarrollo de América Latina (CAF), and even the UN Economic Commission for Latin America and the Caribbean or other UN-affiliated bodies. These institutions should collectively think about how China could play a constructive role in multilateral efforts to help put Venezuela on a more sustainable economic path both in the short and medium run. To date, none of these organisations have played as much of a high-profile role as the OAS, but given their narrower focus on economic issues, they might provide a more practical multilateral platform for greater and more constructive Chinese engagement. If, instead, China chooses to keep a short-sighted focus on existing or future loans-for-oil deals and its idealistic hopes of maintaining stability, this would demonstrate the shallowness of its claims to any kind of leadership of global economic governance. And it would also directly undercut Beijing’s claims of solidarity and development-based friendship with countries in the Global South and in Latin America in particular. A further descent into chaotic authoritarianism in Venezuela would not serve China’s interests or ambitions well. Beijing should take a more active and accountable role now to help create a more viable future for Venezuela and its people. Given China’s talk of a “new era” in China–Latin America relations – not to mention Beijing’s claims that it is now making crucial contributions to global governance and global public goods – now is the time to ask what should be done going forward in terms of China’s broader role and responsibilities regarding Venezuela and resource-rich, but conflict-plagued, developing countries in general. Especially during a period when US disengagement or outright confrontation with its Latin American neighbours may very well grow under the current administration, government officials and citizens in Venezuela and other Latin American countries might look to China to play a larger and more positive role. The same could be said about US and Chinese respective involvement in fragile states in Africa (such as South Sudan), Southeast Asia (such as Myanmar), and elsewhere. Such hopes and demands should reflect higher expectations and standards than they generally have up until now, not only on issues such as environmental and labour standards for Chinese mining and dam investments, but also specifically in terms of helping to resolve the deepening humanitarian and governance crisis in Venezuela. China has had a bigger economic impact in this country, and bears more responsibility for that impact, than anywhere else in Latin America. Beijing, in short, must take a more responsible approach to its relations with Caracas. While Venezuela may present China with its most daunting economic and diplomatic challenge in the Americas, China does and will face similar complications in its ties with a range of resource-rich but conflict-affected developing countries in Africa and Southeast Asia in particular. Burying its head in the sand when faced with its responsibilities in Venezuela and elsewhere will do China no favours in the long run. A 2016 Carnegie Endowment article entitled Venezuela on the Edge: Can the Region Help? concluded with the following observation: “Without diplomatic support and economic engagement from Brasília and Buenos Aires over the past decade… chavismo could not have kept itself afloat or gained such an uncompromising grip on power.” The same can certainly be said of China, and Beijing should take a more active and accountable role now in working with the rest of the international community to help create a more viable future for Venezuela and its people. More broadly, as important as Venezuela is, it is just the tip of the iceberg for the challenges facing China in its nascent efforts to play a bigger, more respected role on the global stage. This article was previously published by Diálogo Chino.